‘Hanezeki’ is a special case of seki, in which a hane stone on the first line is in atari (-zeki is vocalized form of seki, used in compounds). Uberdude: Is "stone on the first line" a necessary part of the definition? The famous Igo Hatsuyo-ron Problem 120 is described as containing a hanezeki, which isn't on the 1st line, so is that description or this definition incorrect? hnishy: I have Fujisawa's book on Hatsuyo-ron, but there is no reference to hanezeki in the solution of Problem 120. At least in Japanese usage, the definition is correct--it's a simple compound of hane and seki. Another case of Japlish perhaps? Maybe we should add the expanded meaning of hanezeki in English. Bill: I am unaware of hanezeki being used in the Japanese literature for the shape in Hatsuyoron 120. Moi, I would not call the shape a hane, but a wedge. However, that usage does appear in the English/Korean literature, particularly in Shared life in Go: an overview: ICOB 2005 (Myongji Univ, Seoul, 2005), by Harry Fearnley. Fearnley also uses the Korean term, jeochim bik?. His paper is encyclopedic, covering many forms of seki, both familiar and unfamiliar. He mentions 130 configurations of hanezeki. His paper is an important scholarly work, published by Myongji University. We can take it as an authority. JohnF. By pure chance I was talking to Harry Fearnley at his home yesterday about hanezeki. He has a huge work on various "beasts" under way. 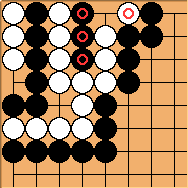 He was asking me whether I had seen a hanezeki in the middle of the board. I said I hadn't and he showed me one (I think he said also that he was the first to publish such a position). I immediately pointed out that it strictly wasn't a hanezeki because the hane was replaced by a warikomi, which of course he knew. 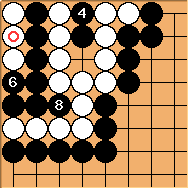 In fact, even in the edge-of-the board version it is possible to concoct a position where the distinctive hane is played in an unusual sequence so that it is not actually a hane as played. Harry asked how I thought the terminology dilemma could be resolved. I suggested using the term itazeki. The old Japanese kanji for hane is not well known and has been misread even by pros (see Hayashi Yutaka's encyclopaedia) as ita (board, plank), a very similar kanji (even more so in handwritten form). I have seen it used outside of the encyclopaedia. In Harry's explanation of various hanezekis he kept using the word "pillar". At a pinch ita can be said to correspond to that. There is also a hidden pun that acknowledges Harry as an expert in another field, too (Planck language). He hasn't made his mind up yet but I'm writing to him later, so I'll ask him to look at SL and possibly comment. hnishy: I would recommend more straightforward 'atari-seki' for the expanded meaning. Both words are widely used in English (and of course in Japanese too). Harry Fearnley: I am persuaded by many of the above comments, and believe that I have misused the term. However, I have a major reservation: although I have discovered, and analyzed, many strange sekis, I am certainly not any kind of authority on the _naming_ of these positions. I have had an extensive private correspondence with JohnF.. He has convinced me that I have been wrong to try to extend the use of the term "hanezeki" to include all the positions that I have been trying to include. The proposed term "atari seki" may be problematic for Japanese speakers, but even if it were considered acceptable, I would not be happy with that either, because then it would seem to have to include positions that I would want to keep separate -- e.g. 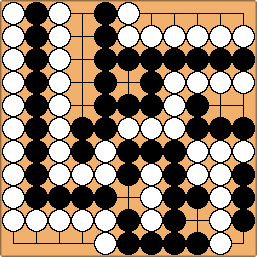 all sekis in which there are two opposing groups which can each capture chains/lumps yielding equivalent numbers of liberties. All the positions that I want to include in a generalized "hanezeki" have one feature -- an external "tail". In the traditional "hanezeki", the "tail" consists of a single stone. I suggest that we use the term "tail seki" instead of (generalized) "hanezeki", and then we can keep "hanezeki" for the pure, traditional, one. Should we not be having this discussion on the "discuss page", and if so when can we remove this from the main page? Both sides have a string in atari, but for either side, capturing starts a capturing race that the other side can win. Best play is to leave this, therefore it's seki. Neither player can win the capturing race by playing first. The explanation on why this is so follows. Suppose Black captures at . Then captures the Black stones in a snapback. Black has no better move than to play to reduce White's liberties. But and clearly wins the capturing race by three liberties to two. Suppose captures, then makes a placement. Note that both players have a big eye each. 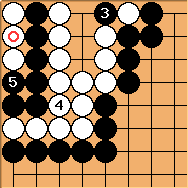 By capturing the three Black stones, White has made his own eye small. See big eye - small eye for more. makes an approach move, forcing to capture three White stones. However, when makes the necessary placement, wins the capturing race by two liberties to one. Now suppose plays elsewhere. To prove that Black still can win this capturing race, can play inside White's eye. Later, captures, forcing the placement at , and again wins the capturing race by one move. To conclude, the player who starts the capturing race first loses it instead. Therefore, the hanezeki is effectively a seki. The Most Difficult Problem Ever has a beautiful example from the Igo Hatsuyoron of a (maybe temporary) Hanezeki, involving the sacrifice of 20 stones to make even more stones live! This situation is especially counterintuitive: the main semeai is me-ari me-nashi (one eye vs no eye), but it is nevertheless a complete seki, with 5 unplayable mutual liberties. The locus classicus of the term hanezeki is Volume 3 of Hayashi Genbi's Gokyo Seimyo (1835, folio 9, verso). He gives one example. That alone makes the attribution to Kaise Takaaki (though I'm not at all sure that Ikeda says that anyway) wrong by a century, but in fact the earliest known case of hanezeki is the problem called Zheng Li (Wrestling) in the Xuanxuan Qijing (Gateway to All Marvels), so that puts the date back to 1347 straightaway! Hanezeki is also sometimes wrongly called itazeki from confusion with the first character. Note: elsewhere, hanezeki may be referred to by the terms, haneseki, or hane seki, without vocalization.